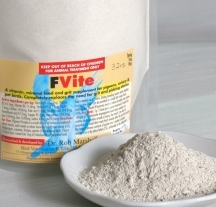 F-Vite is given in a dish or on the feed and has been developed as a combination grit, protein, energy, vitamin and mineral supplement, which is especially beneficial for breeding and young molting birds, but is used all year round. It is palatable and the birds actually look for it when feeding young, because it is rich in the essential vitamins and minerals for growing babies and is also a rich source of energy. Babies fed by parents, who are given F-Vite grow quickly, are robust and pink. There is no need for any other kind of grit, cuttle bone or mineral powders during the breeding season. Most fanciers believe that the grit and cuttlebone they use provides their flock with all the minerals required for good health. However, this is not so. The regular grits are deficient in iodine, iron and most trace elements. The main function of grit is to provide the bird with a source of digestive stones and some mineral salts. The levels of mineral salts in the grit are too low to be of any value. These same salts attract moisture from the air and can cause the grit to become moist. Some fanciers even wash the grit before feeding. Any moisture in the grit promotes harmful bacterial growth and contamination. E.coli and related bacteria are commonly found in wet grits because of the dead and decaying mollusks, which inhabit the grit shells. Some of the bacteria produced by these decaying marine animals is toxic. Contaminated grit is a common cause of wet droppings and enteritis in caged birds. Grit does not provide all the minerals necessary for good health and this is why birds enjoy picking at the soil on a clump of grass. The soil provides added minerals especially iron, magnesium and other field elements, for which birds crave. Soil, however, is a potential source of bacterial and fungal infections and is best avoided. There is no wastage with F-Vite as the birds consume every last portion. It contains 10% shell grit, enough for birds to digest their food properly. The shell grit portion of F-Vite is baked at high temperatures to ensure sterility, without damaging the potency of the minerals or grit. The bentonite is a bowel detoxifier and astringent, which guarantee tight black and white droppings. The end result is a concentrated mineral supplement that enhances health and vitality. The energy rich desiccated molasses and the scientifically balanced and concentrated vitamin, mineral, trace element and mineral salt mixture make this a perfect product for feeding parents. Breeding birds have extraordinarily high demands for minerals, salts and trace elements and require supplementation on a daily basis. The hens require the minerals for egg laying and the feeding adults require extra mineral salts and energy, which is provided by the F-Vite. Feeding parents attack F-Vite with relish because it provides all of the "field elements" and more. It is necessary to remove all other grit and mineral powders from the flock being introduced to F-Vite for the first time. 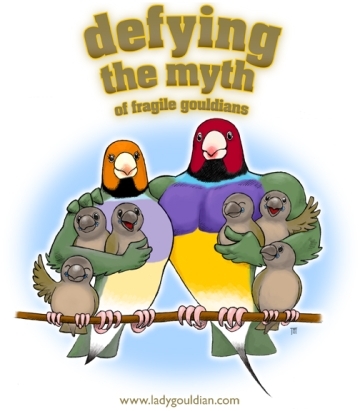 With some finches, you can add small broken eggshells to the F-Vite to encourage a quicker acceptance. This allows the birds to accept the new taste as quickly as possible. The birds prefer the taste of F-Vite when it is mixed on the seed. The babies "raised on F-Vite" relish the taste in the aviary. Place the powder in a small dish in the aviary preferably next to the water. For some reason, they like to eat it after drinking. Replace when empty or when it turns brown. The mineral salts attract moisture from the air on wet and humid days, turning it brown. All grits absorb this moisture but it is not clearly visible in them as it is in F-Vite. F-Vite acts as a bowel astringent and "cleanses" the bowel of harmful toxins, thereby producing a small and hard dropping.